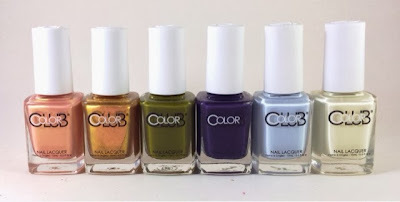 Color Club has sent me their newest collection to swatch for their Spring 2014 collection! I have been a busy bee swatching through this nor'easter that's hit New York. The collection is a bit unexpected for Spring with mostly deep hues and shimmery metallics. The only pastel "spring" shade is a very light blue. I like the change up here since we're bound to see lots of light floral shades this season. Color Club has overhauled their bottles! The old bottles are on the left and the new is on the right. The shape is still square but the lids and logo has changed! The bottle lids are now a white, rubbery, easy grip top. The logo is a smaller white 'Color' encapsulated in a large black 'Club'. The top of the brush handle has two C's spooning each other. The old bottles did have a more juvenile feel to them so I am enjoying this sophisticated new look. In De-Nile is an opaque creamy baby blue. I used three coats for full coverage. The formula is very glossy when dried. I'm loving this shade for spring. Aside from this pastel blue the rest of the collection is very striking and varies from the typical light colors you'd expect to see. Safari Sunset is a metallic? Or maybe just full of shimmer? It's hard for me to tell! I'm going to go with metallic. Unlike many metallics that streak this does not! The gold hues pick up on any light that may scamper across the nail. This is one of my favorite shades from the collection! I've never really been positive on what the actual color of eggshell white is. When I saw Look, Don't Tusk for the first time a light bulb went off, this is it! This off white, like many whites, needed three coats for full coverage. Since today is Valentine's Day I decided to cover Look, Don't Tusk with some stamping. This design is from Bundle Monsters H16 plate and features a full nail rose design. The Bundle Monster plate was sent courtesy of Nail Polish Canada. If you're lucky enough to be Canadian shipping is free! I topped the design off with a matte topper to give the roses a softer look. Nail-Robi is an inky indigo cream. In light this shade seems more of a violet hue and in dark it becomes a brooding navy. Typically, darker blues like this are a popular winter color but here it is for spring. I love dark blues so I am looking forward to incorporating this into matching looks this season. Lion's Den is an impossible to capture glittery shade. Upon first look it is a strong gold. I caught some greenish hues at angles. Even with three coats Lion's Den is a bit sheer. One coat is very light so this could be very fun to pair over solid creme colors for enhancement. Although crelly sounds like some kind of bad hip hop term it's really just nail speech for a cream/jelly hybrid. Tribe and Tribute is a sheer green shade in one coat. Layer it to two or three and you'll start to build opacity until, ta da! Full coverage. Shown here are three coats. Now, I traditionally don't like green. Yellow and green are my no-no shades. They make me look ill when I've got them on. If you can pull off this avocado green go for it! 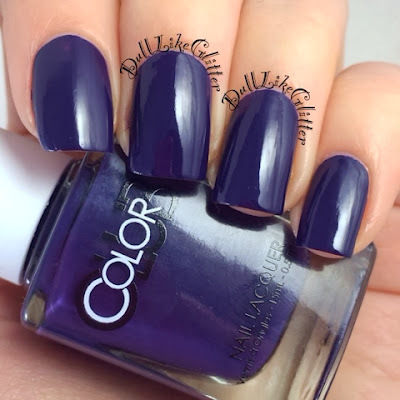 I'm actually hoping Color Club will release some other shades in this crelly finish. I am excited to see Color Club's new bottles. I feel that they'll be stepping their polish up to a more sophisticated realm. I am liking this collection since we're bound to see an influx of pastels this season and it's nice to have some options. What do you think of Color Clubs Safari Garden collection? great looking collection! the white caps will be hard to deal with in my large collection of black caps, but its not a deal breaker! lovely swatches! I really like Nail-Robi and In De-Nile. Do you happen to have the new essie resort collection? 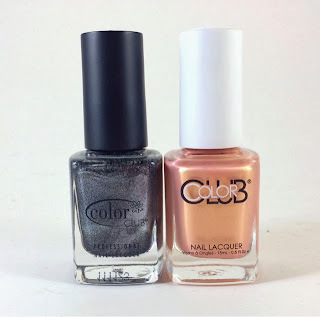 I'm dying to see those two shades compared to essie Under the Twilight and Find me an Oasis.